We’re thrilled that the Active Classroom has picked-up its second award at the ‘Wales Green Energy Awards’ in Cardiff on Friday. The classroom was recognised for its ‘Contribution to Skills & Training’ – an award that celebrates the company that has made the greatest contribution to developing the renewable energy workforce for Wales, now or for the future. Winners from other categories include Swansea Community Energy & Enterprise Scheme for “Best use of Renewable Energy in the Public Sector”- SCEES are a community-owned renewable energy company developing projects for the benefit of local residents. 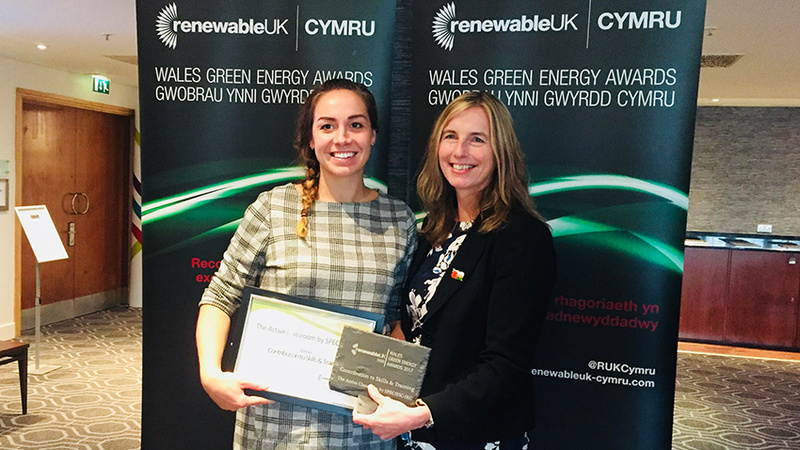 Plus, Vattenfall’s ‘Pen y Cymoedd Wind Energy Project’ picked up the “Outstanding Renewable Energy Project” award for its 76 turbine development. Earlier in the year, the Active Classroom won the ‘Innovation Award’ at Constructing Excellence Wales so we’re delighted to have received further recognition at the Green Energy Awards 2017. As well as providing a necessary test facility, the Active Classroom provides much-needed teaching space for the University. The classroom has hosted a range of events; such as The British Science Festival; and visits from other educational establishments and local groups to learn about industry developments and the buildings of the future. We look forward to welcoming more teaching groups to the Active Classroom in 2018!